In the front part of the imperial necropolises, there usually is a Sacred Way (or Divine Road) which means the road leading to heaven. The Emperor, known as the Son of the Heaven, who came from Heaven to his country through the Sacred Way, also deservedly would return to Heaven through this road. 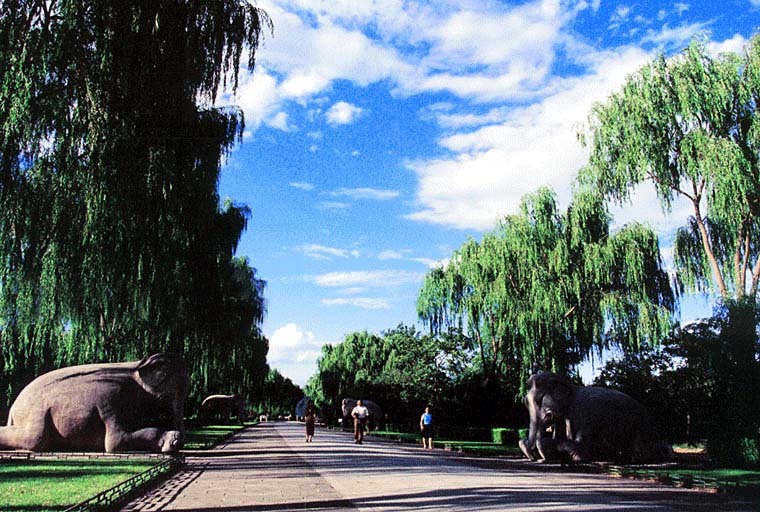 Among the many Sacred Ways, the one of Ming Tombs' is best preserved and complete. The Sacred Way starts with a huge stone memorial archway lying at the front of the area. Constructed in 1540, during the Ming Dynasty, this archway is the earliest and biggest stone archway existing in China today. Farther in, the Shengong Shengde Stele Pavilion can be seen. Inside it, there lies a 50-ton tortoise carrying a stone tablet. A white marble Huabiao (ornamental pillar) is positioned at each corner of the stele pavilion. At the top of each is stationed a mythical beast facing either inward or outward, expressing hope that the emperor will neither cling to the palace nor forget to return to the Palace to handle state affairs. Then come two Roof Pillars on each side of the road, whose surfaces are carved with the cloud design, and tops are shaped like a rounded cylinder. After the 18 pairs of stone statues which are all sculpted from whole stones, and larger than life size, comes the Dragon and Phoenix Gate.